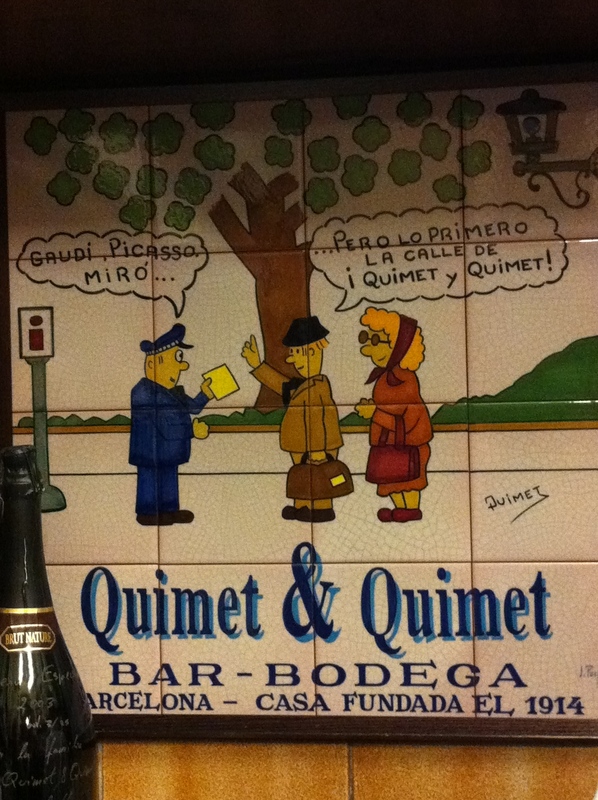 Our landlords in Barcelona gave us a special gift – a certificate for an evening of regional treats at Quimet & Quimet, a local bar/bodega. 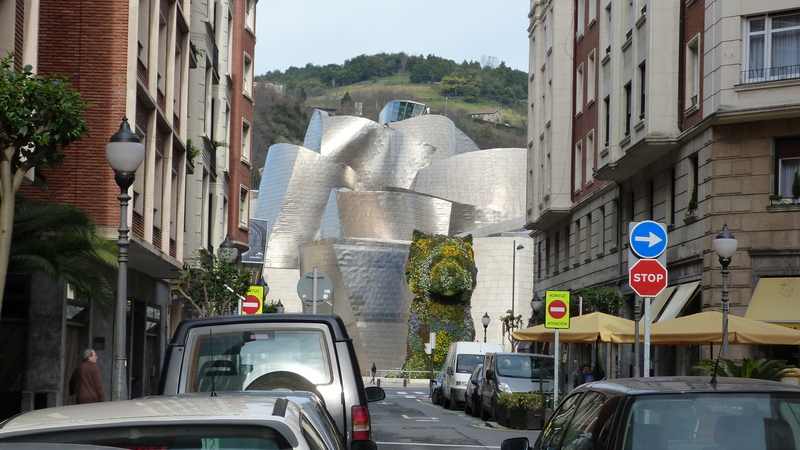 We decided to go there on our return from Bilbao. The minute we walked in, we felt a great sense of camaraderie. A tiny, one room space, Quimet & Quimet has been going since 1914 passing from one generation to the next and currently run by a brother and sister team. The small room is filled with bottles of wine and spirits floor to ceiling (some, perhaps, that have been there since the bodega opened). There is a long prep counter along one wall, where the owners were busily working. The place felt full with only 14 customers. There were no chairs and only two tables to stand at, so we parked ourselves beside a long refrigerator filled with wine bottles. When the owners understood that we had been given a gift certificate, they filled our glasses with Cave, put the remainder of the bottle in the fridge beside us, and told us to fill our glasses whenever we needed. Then, over the course of the next hour and a half, they treated us with 16 different montaditos – little cold tapas creations on crusty breads. The montaditos are improvised every night, depending on the fresh ingredients at hand. We explained that we were eating pescatarian/vegetarian and were presented with assemblages of fish, shellfish, roe, beans, cheeses, fruits and vegetables. We set them out along the top of the refrigerator and shared them amongst the four of us, only regretting that we didn’t know what most of the ingredients were. Joana, one of the owners, told us what she could, but between her Spanish, and our ignorance, we were not always sure of what we were eating. However, they were exciting and unique tastes, lovingly and individually created. Because there were no tables, we felt as though we were in someone’s home, at a great party. The hosts were creating food, non-stop, but also chatting with people and keeping the “party” going. Soon we had met and had great conversations with almost everyone in the place. Quimet & Quimet specialize in local cheeses. Someone told us about Cabrallas, “the strongest sheep’s milk cheese”, made in the north of Spain. It is wrapped in “vegetable matter”, buried in the ground under cow manure and left to age for a couple of years. Apparently, the homemade version is eaten with the worms that gather around the edges. The commercial version, we were assured is worm free. We finished the evening with Portado Miso, a chilled herbal digestif from Galicia. We walked back to the apartment feeling really lucky to have been invited and wishing that we could spend a lot more time there. 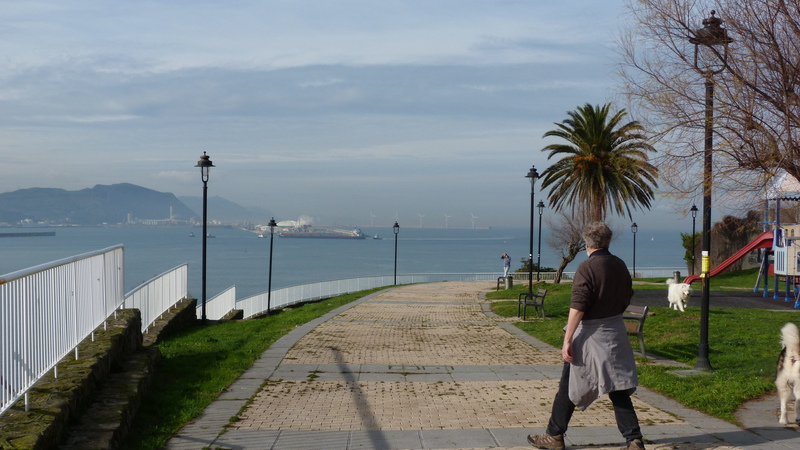 We spent the next day walking along the harbor and visiting galleries. 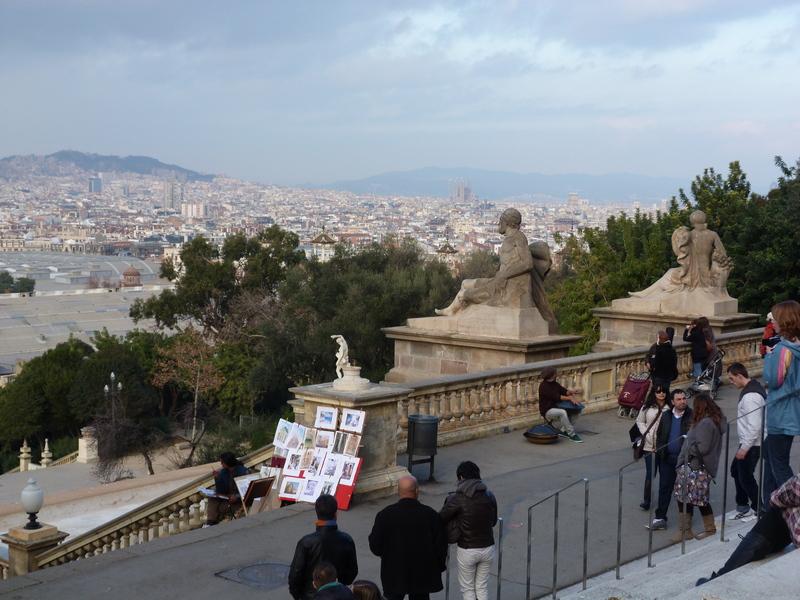 We went to the Joan Miro gallery on Muntanya de Montjuic overlooking the city, and to the Picasso museum in Gothic palaces in the centre of the old city. 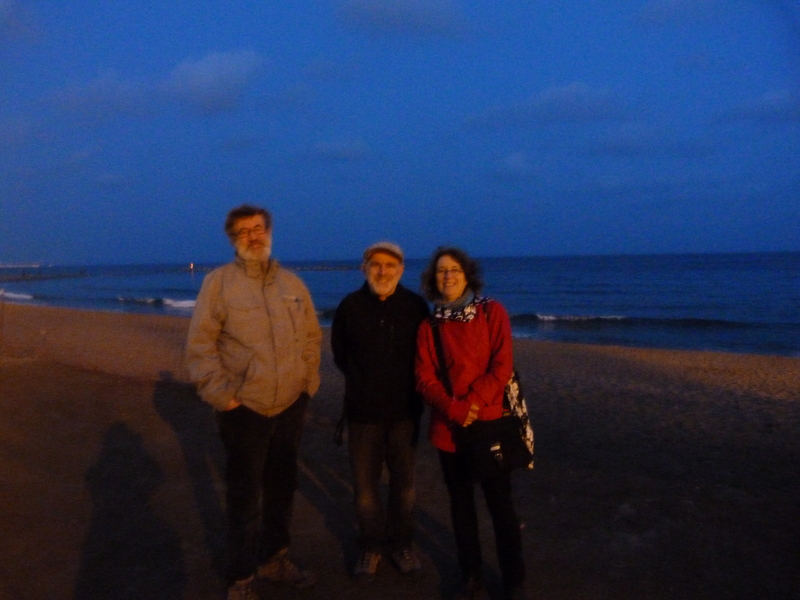 Both gave us insights into the artists’ connection to their Catalan childhoods and the influence that they had on each other’s work. 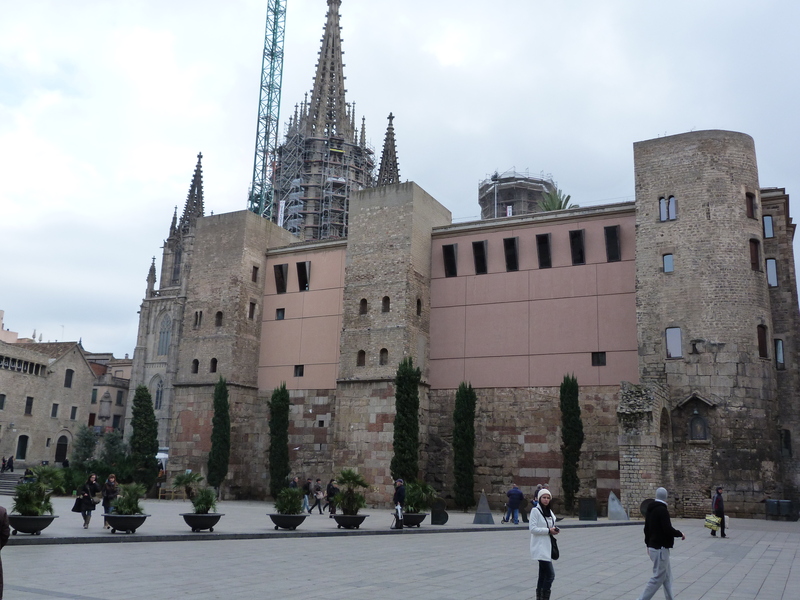 Inspired, we decided to go to see the work of the third great Catalan artist of the twentieth century. 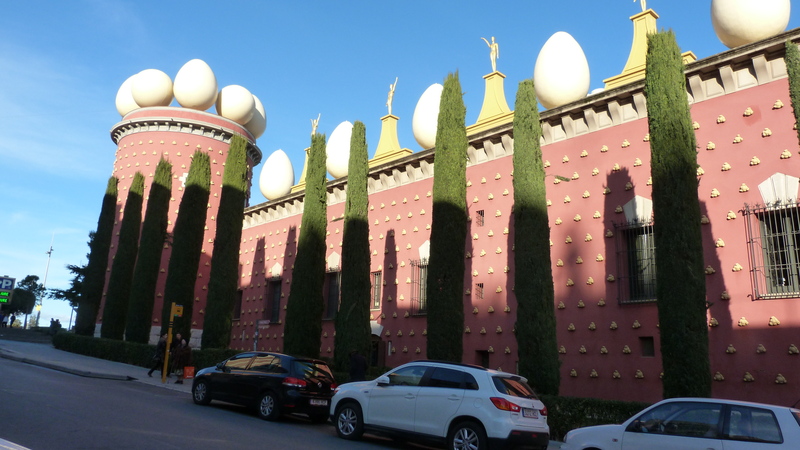 We went to the small town of Figueres, about 60 miles away, to experience the Dali museum. 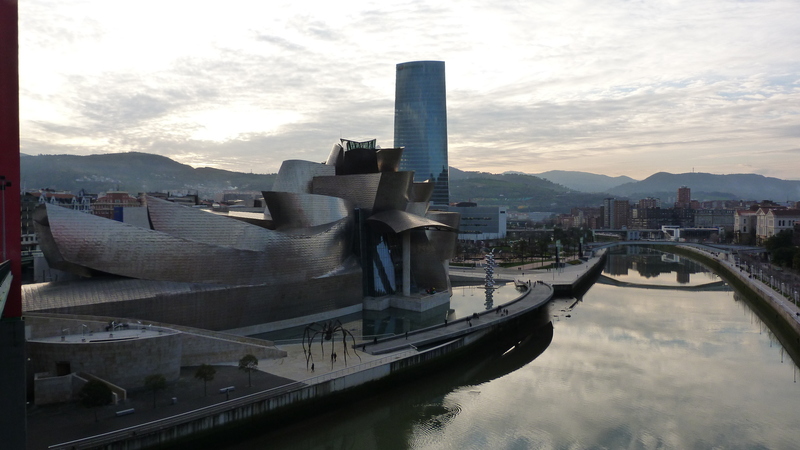 Dali created his museum in a renovated theatre in his hometown. 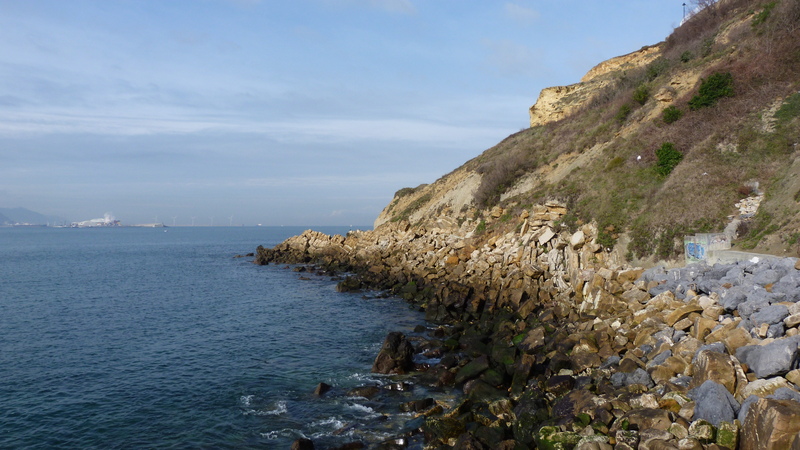 He knew it would put the town on the map as a tourist destination and it certainly has. 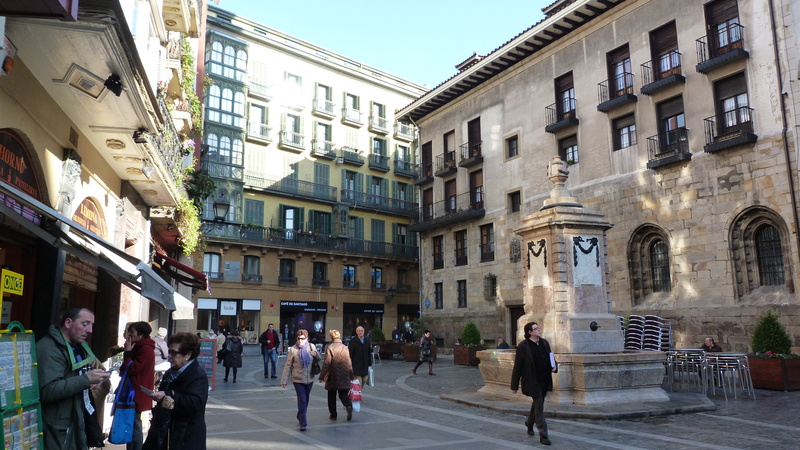 Figueres is a pretty little Spanish town, quite ordinary, except for the fact that it houses the world’s most elaborately eccentric gallery. 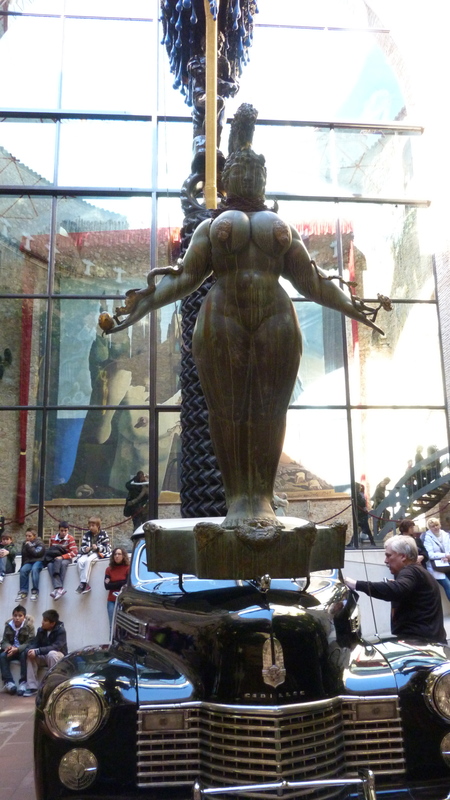 The Dali museum is totally fun. It is arranged randomly, although there are arrows to guide you so that you don’t get too lost. 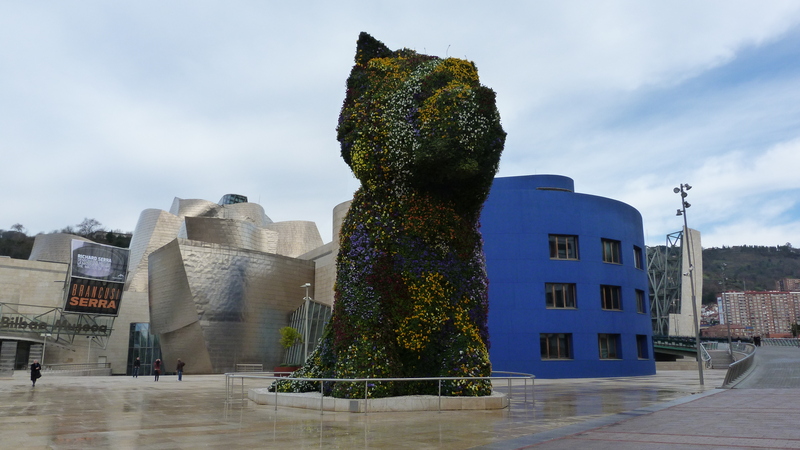 It is filled with whimsical things that Dali made specifically for the museum. He also built it knowing it would also be his “final resting place”. His tomb is in the middle of the gallery, in a surprisingly conservative setting, surrounded by his gold jewelry creations, turning him into a kind of Faberge icon. 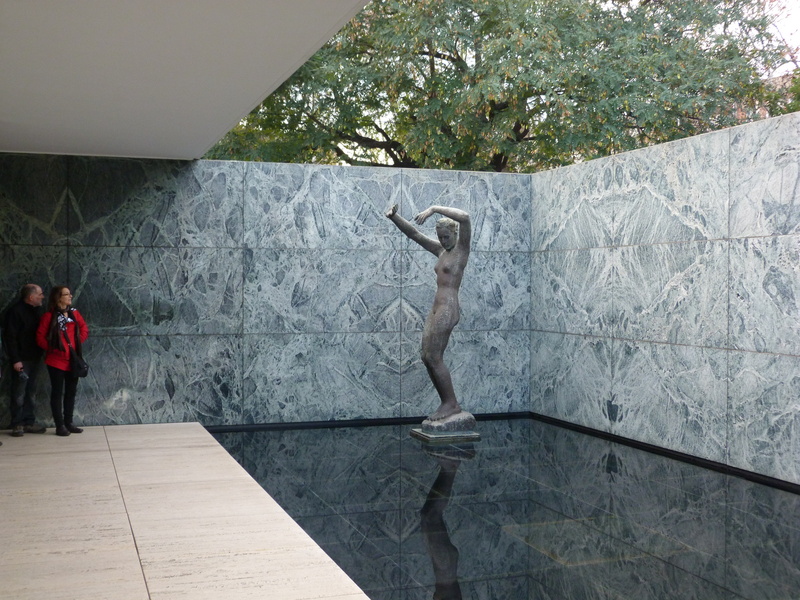 The central courtyard of the gallery is filled with a sculpture based on an old car. 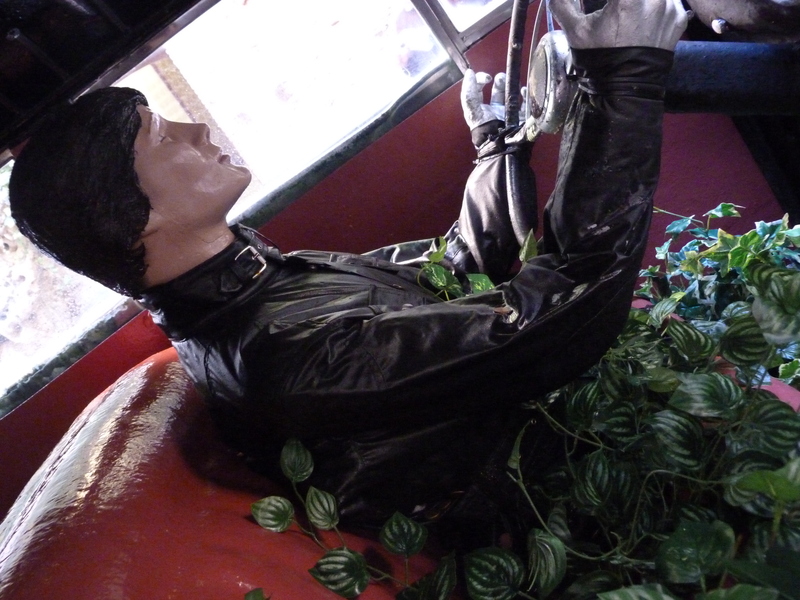 When you look inside the car, the driver is being consumed by ivy. For one euro, you can make it rain inside the car. 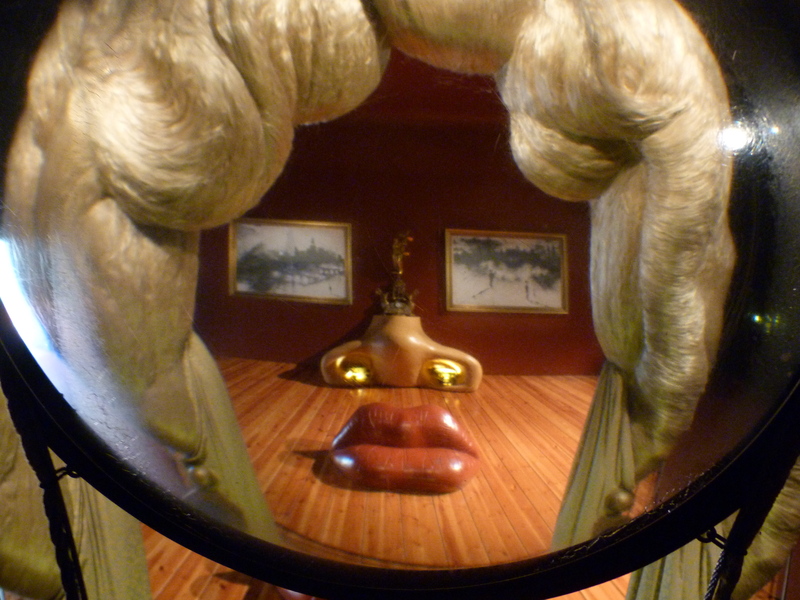 The “Face of Mae West which can be used as an apartment” installation is an apartment size recreation of a Dali painting. By looking through a concave glass, the three-dimensional pieces come together to reproduce the painting. 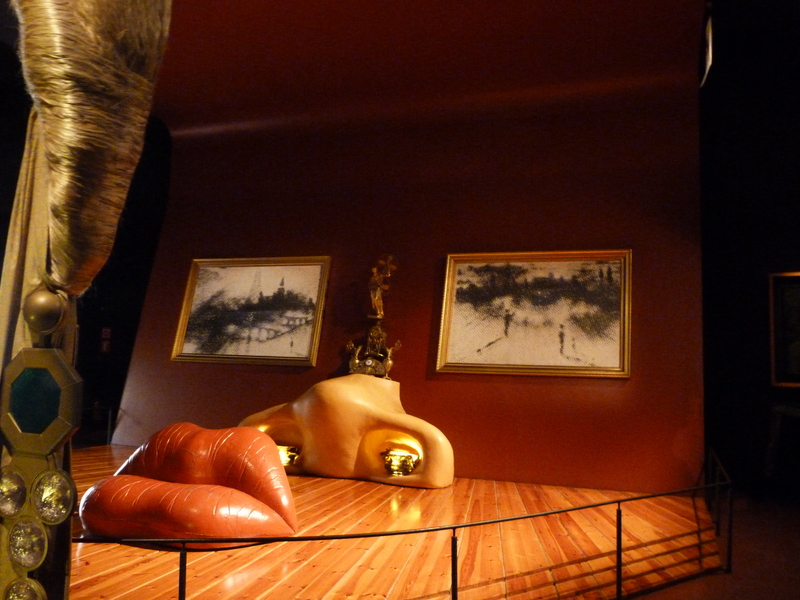 Throughout the gallery there are wonderful drawings and paintings, reminding you how technically accomplished Dali was. 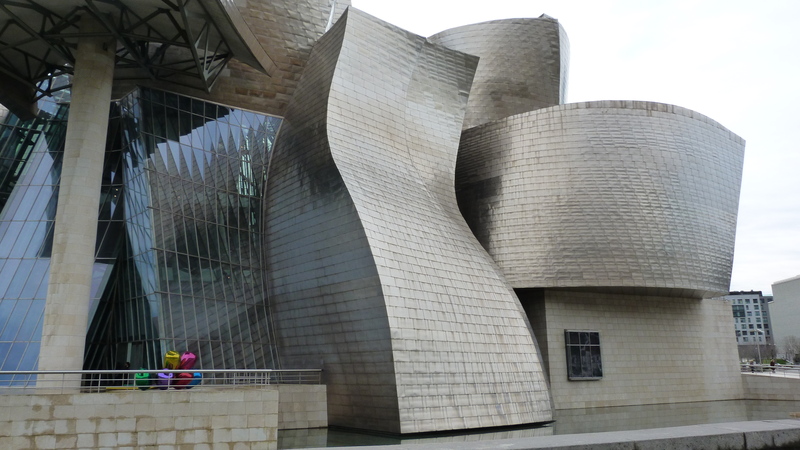 Because we had spent the previous day with Miro and Picasso, we saw connections – a Dali hologram with elements of the same Velazquez painting that we had seen recreated as a cubist painting by Picasso. 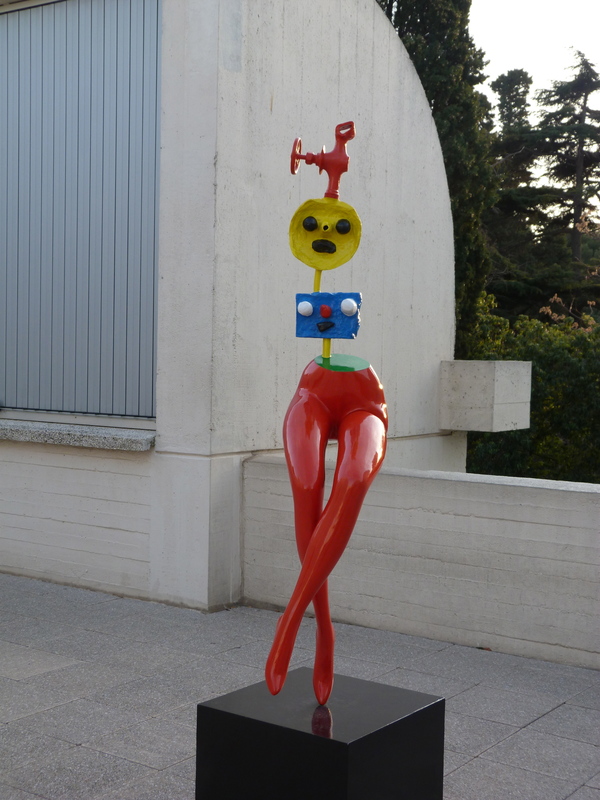 A mannequin leg sculpture almost identical to one of Miro’s sculptures we’d seen. The gallery became greater than the sum of its parts. Politics, art, environment. Food and wine. All in the eye of the beholder, and we had beheld a lot. 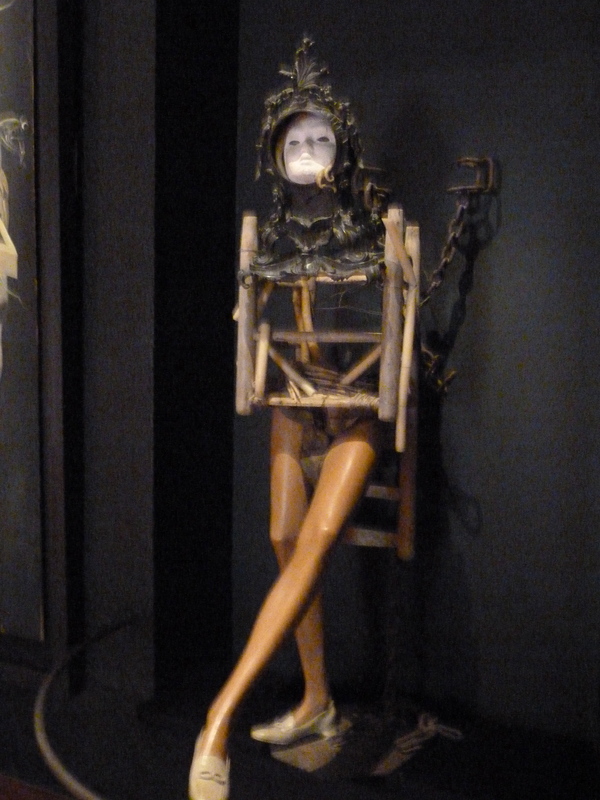 Visiting this surreal gallery in the midst of a very ordinary, but lovely little town, made Dali’s work seem even more startling. 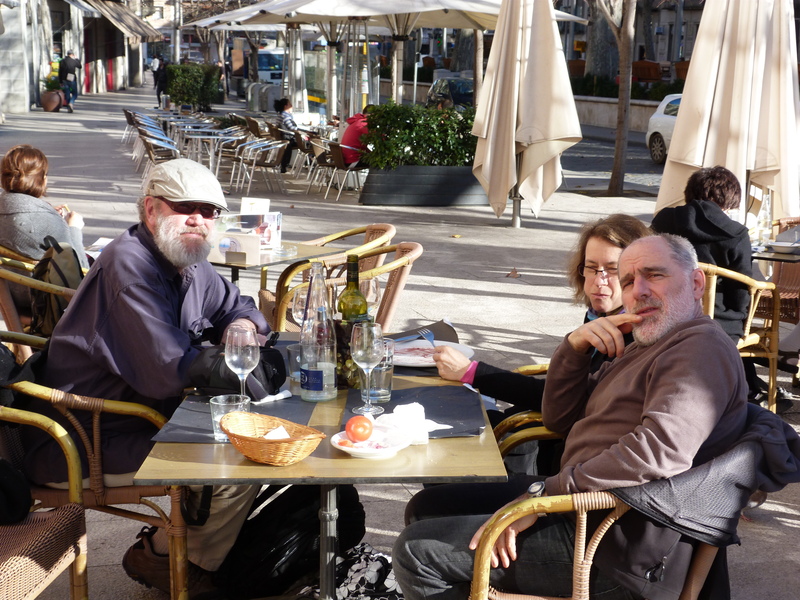 We sat outside at a café in the main street of Figueres to soak up the sun and the juxtaposition. 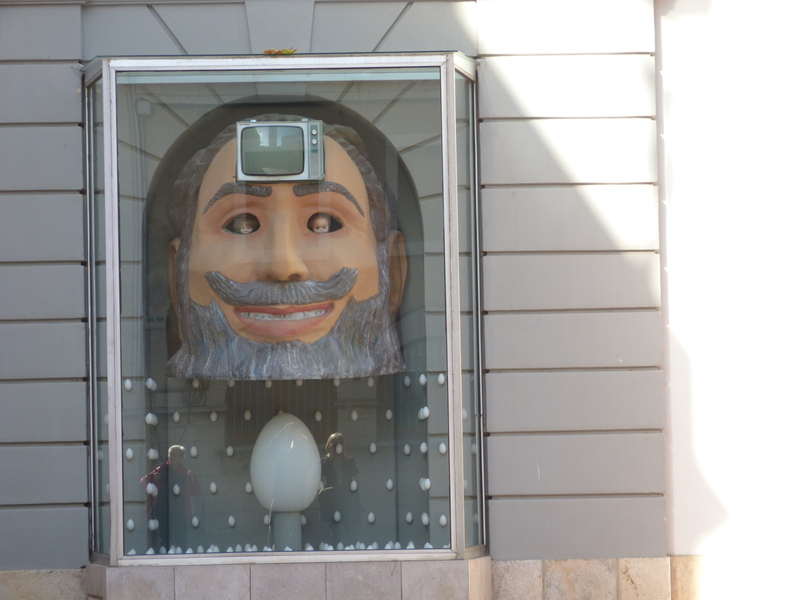 It was a fitting farewell to our time in Spain, a land of many surprises. 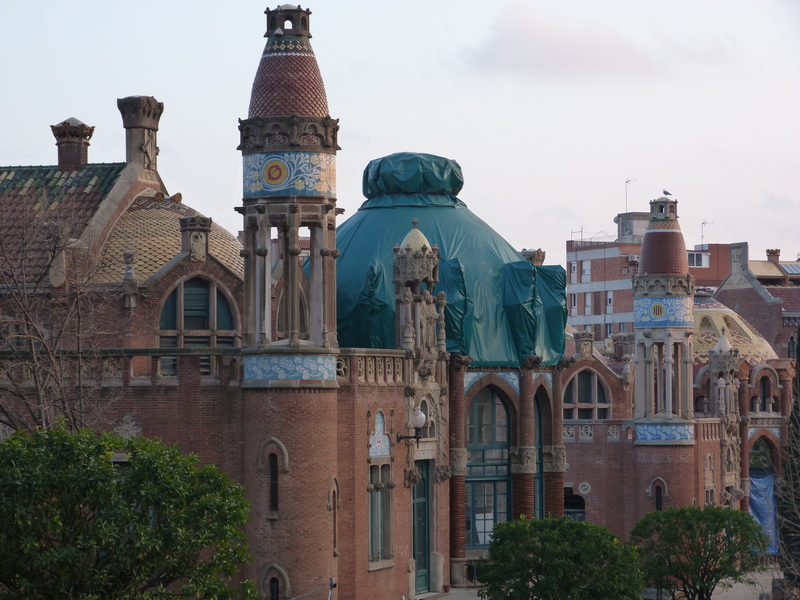 One of the main reasons for wanting to go to Barcelona was because of the work of Antoni Gaudí. I have always been enchanted with photos that I have seen of his work – large fantastical monuments, whimsical and daring, connecting earth and spirit. 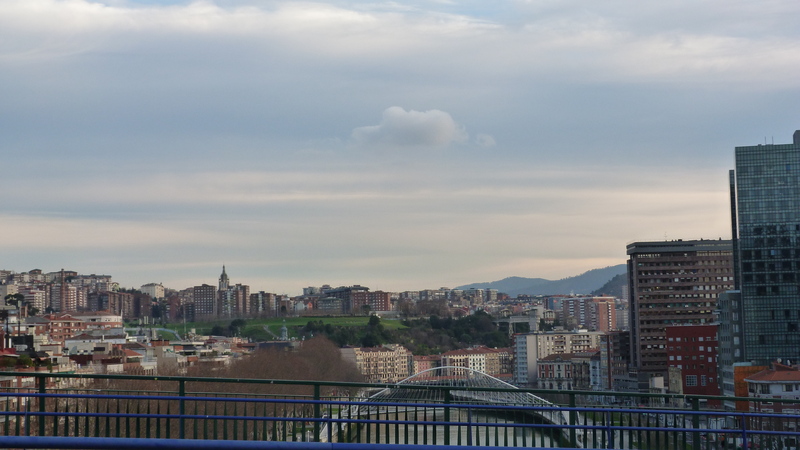 I found it hard to believe that the buildings and forms would really be there, in the midst of a busy city. 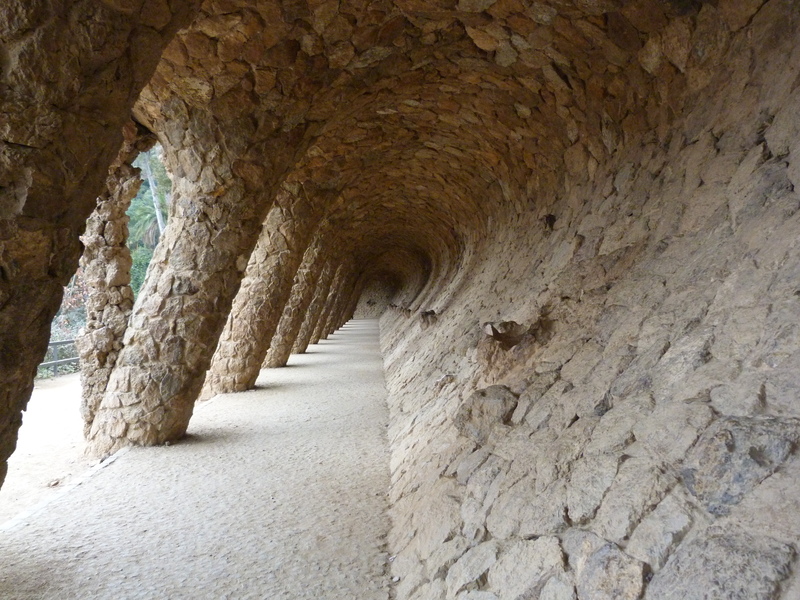 Gaudí grew up in the countryside in Catalunya, a sickly child who loved to be in nature. 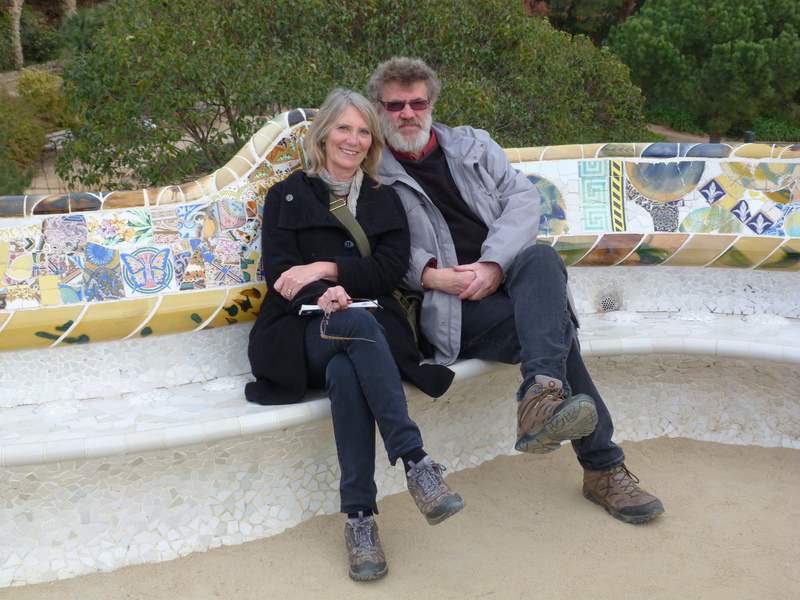 “With the flowerpots, surrounded by vineyards and olive groves, cheered by the clucking of hens, the song of the birds and the buzzing of the insects, and with the mountains of Prades in the distance, I captured the purest and most pleasant images of nature that is ever our Mistress” (Gaudí). Everything in his work was dictated by a connection to the organic forms in nature and to a deep spirituality. 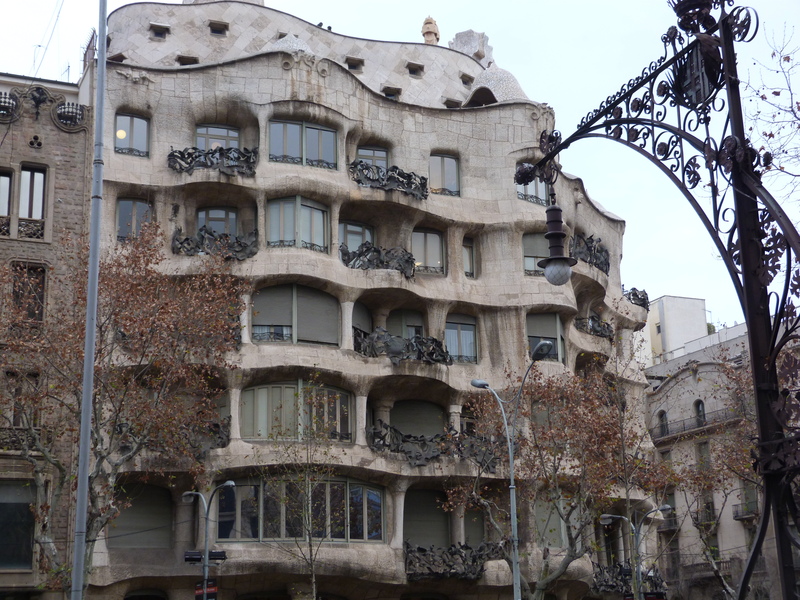 There were three main works of Gaudí’s that we wanted to see in Barcelona: the cathedral Sagrada Familia; Parc Guëll; and the apartment house Casa Milà. 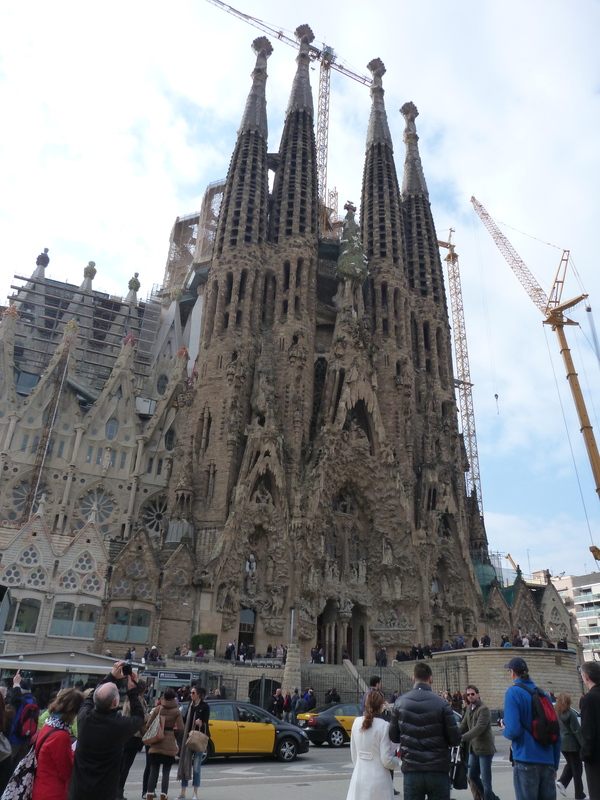 The first stone for Sagrada Familia was laid in 1882. They think it might be finished in the first third of this century. 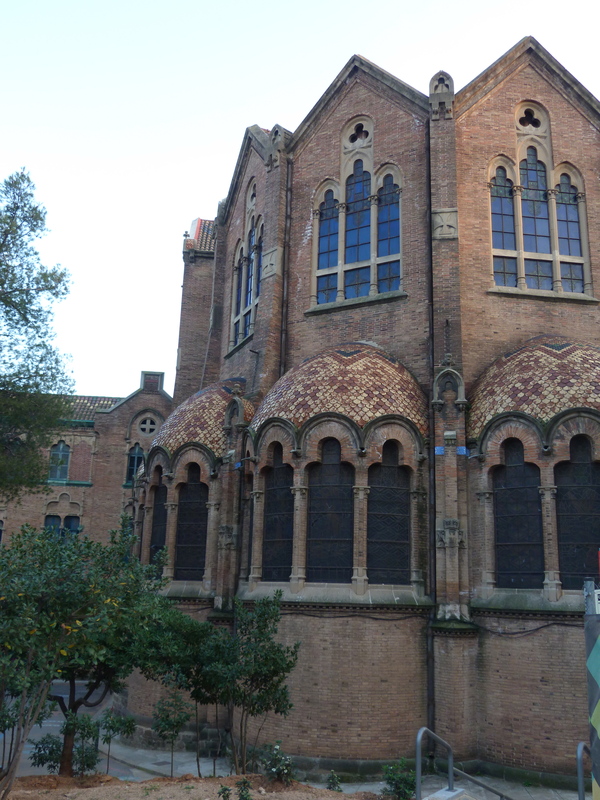 Thousands of builders and artists have worked on it over the last 125 years in what is truly a labour of devotion. 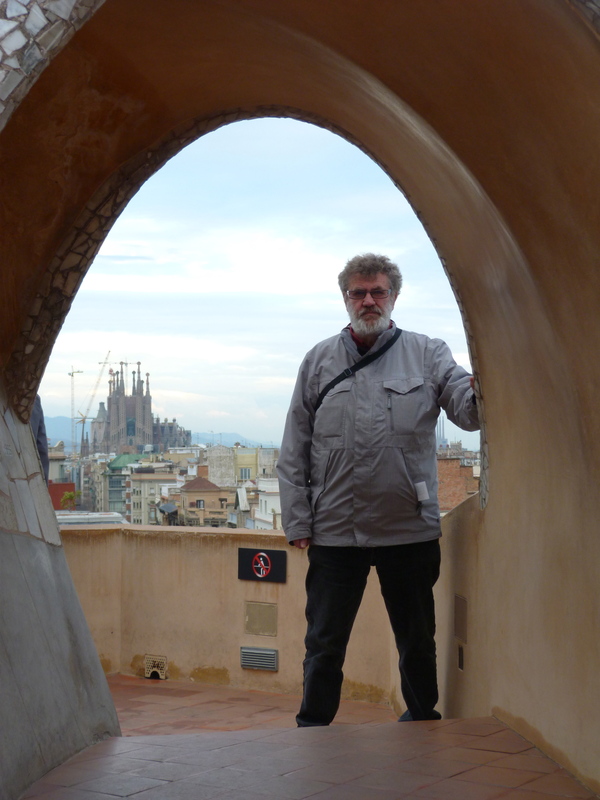 Gaudí himself lived on site for the last 10 years of his life. 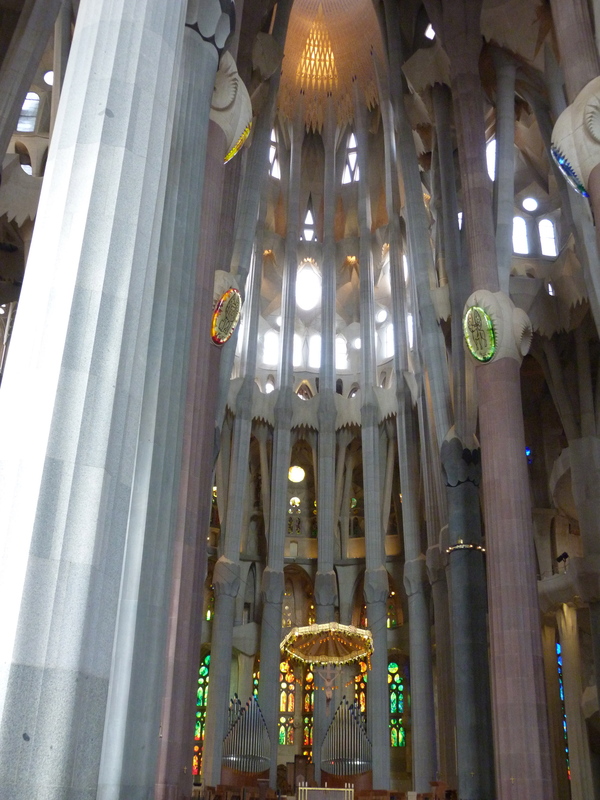 Visiting Sagrada Familia was an overwhelmingly spiritual experience. This, I thought, must have been what it was like to go onto the construction site of Notre Dame Cathedral, which took a mere 80 years to build. 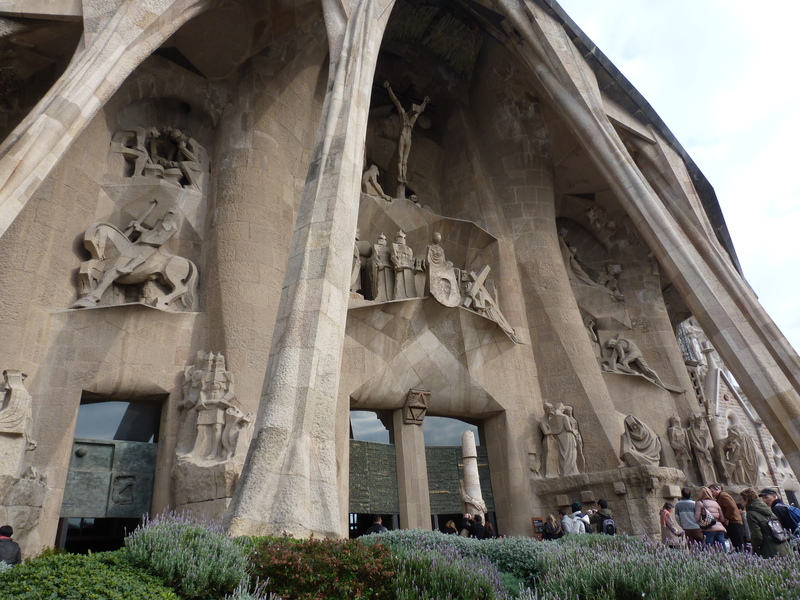 Sagrada Familia is vast in size, scale and imagination – everywhere you look there are carvings, images with resonance to Christian symbolism. There is light, space, and a feeling of soaring energy. Sagrada Familia the trinity triangle above the alter, made with mosaic and light. 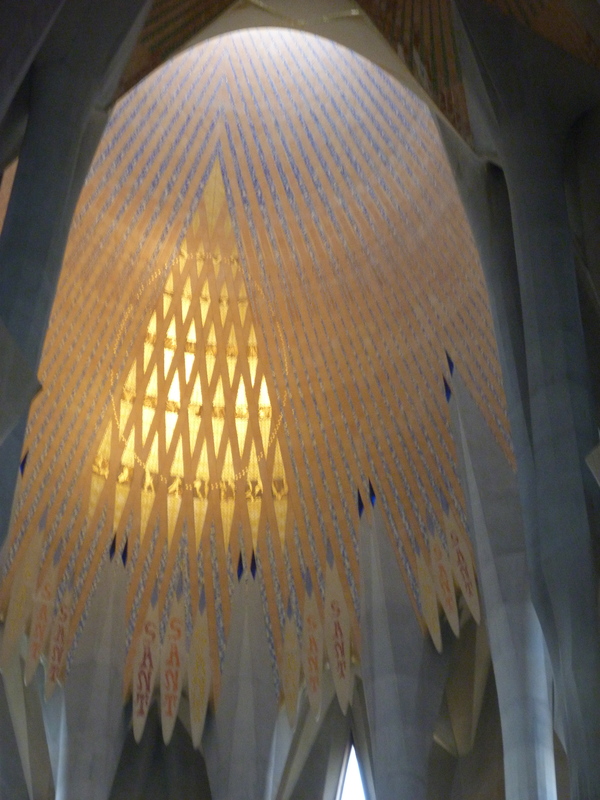 “The expiatory church of La Sagrada Família is made by the people and is mirrored in them. 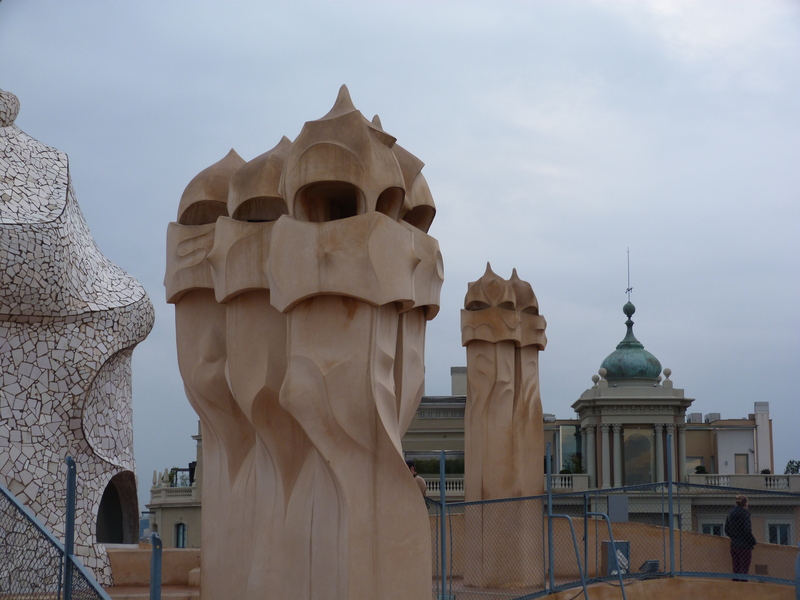 It is a work that is in the hands of God and the will of the people.” Gaudí. This commitment to the people included building a school, on site, for the children of the workers. A cozy place to learn. 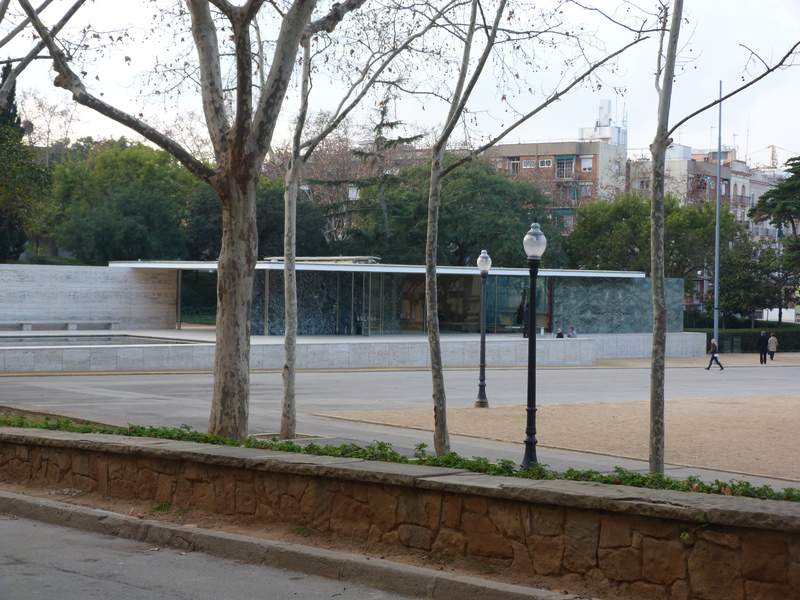 In these days when we expect instant results, when monolithic buildings are built in a matter of months, it is extraordinary to think of the commitment that Barcelona has made to this long-term, monumental building project. You can see it from every part of the city. Words and pictures cannot do it justice. You will have to go to see it yourself. 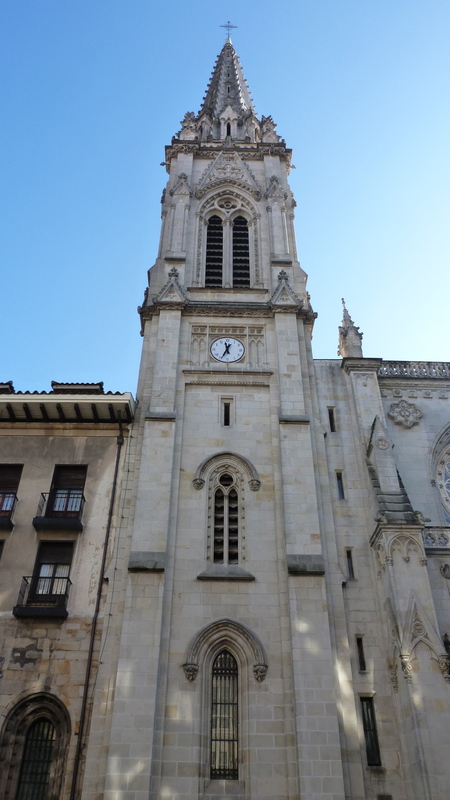 And when you do, you will be reminded that your entrance fee will go toward helping to complete the cathedral. A good reason to go. 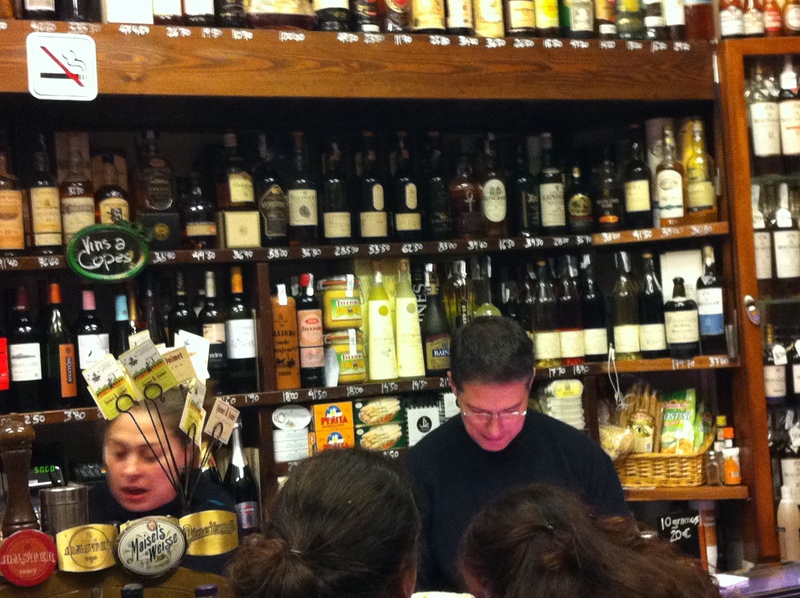 A few blocks from Sagrada Familia we found ourselves in a perfect little “Tienda y Restaurante”. It was our first big meal in Barcelona and without knowing it we began an incredible three-hour lunchtime extravaganza at Los Bellota, productos de Extremadura. 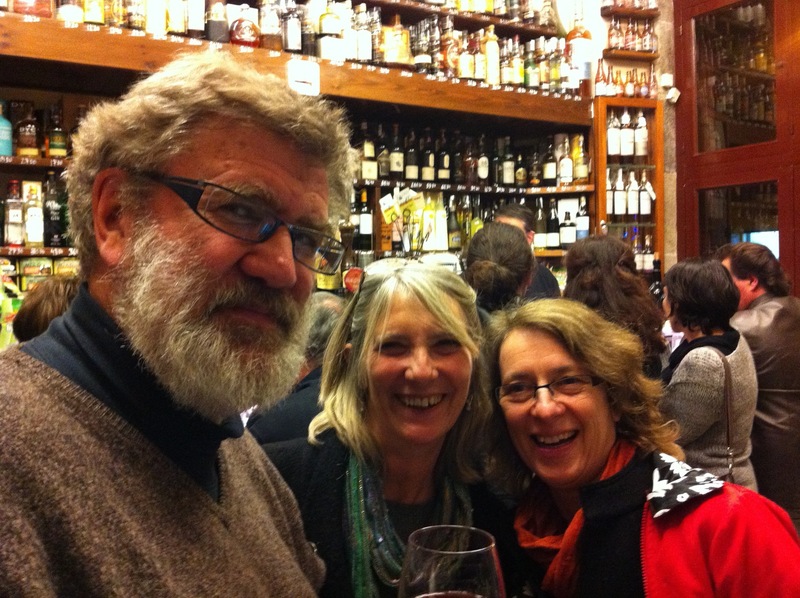 Extremadura is in western Spain, an entirely different climate and markedly different cuisine from Catalunya. It was at this meal that we were taught the Spanish way of enjoying bread. A basket of bread, deliciously toasted and rough on one side, was brought to the table, as well as several whole tomatoes and large cloves of fresh garlic. We were a bit mystified until our waiter came over to show us what to do. Rub the garlic directly onto the warm bread. Cut the tomato and rub it directly into the bread. Dip it into olive oil. Simple and really, really good. The trick is in the roughness of the toasted bread – it must have the right kind of grating quality to liberate the garlic and tomato juices. Bread was followed by multiple dishes of exciting tastes: “Torta Extremeña”, a baked and runny cheese that we scooped onto little toasts; “Boquerones con tomate”, anchovies on tomatoes with a parsley drizzle; “Bacalao Dorado con Cebolla y Patatas”, a kind of fry up with cod, onion and potato; “Ensalada con Queso y Frutos secos con Miel”, salad with greens, cheese, nuts, dried fruit, honey and potato (thin crisps, really) with a kind of wine vinegar reduction. Honey is used a lot in Extremadura cooking and the honey and potato combination is apparently common. The table was heaped with food and everything was incredibly good. 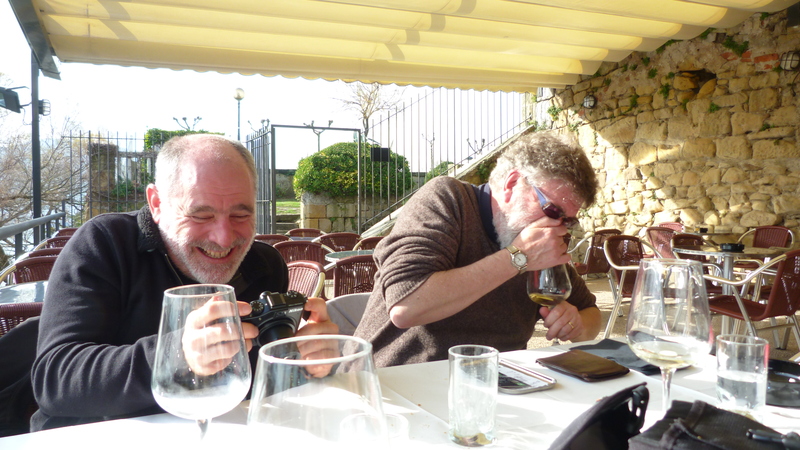 We drank a wine from the region, “Macabeo Campo Barro”, and when we were sure we couldn’t fit in one more mouthful, the waiter brought us a digestif, on the house – a frosted drink that seemed to be a kind of aqua vitae with caramel liquour dripped in. It was delicious, the perfect finale to the meal. He left the bottle at the table, encouraging us to have as much as we liked, which was generous but considering how full we were, impossible. There is something amazingly wonderful about huge meals in the middle of the day. This was to be the first of many extravagant lunches, with many tasty plates and incredibly good local wines. It was a good thing we had so much walking to do, so many sights to see. Gaudí was commissioned by Pere Milà 1906 to begin work on Casa Milà, affectionately called “La Pedrera”, the stone quarry. 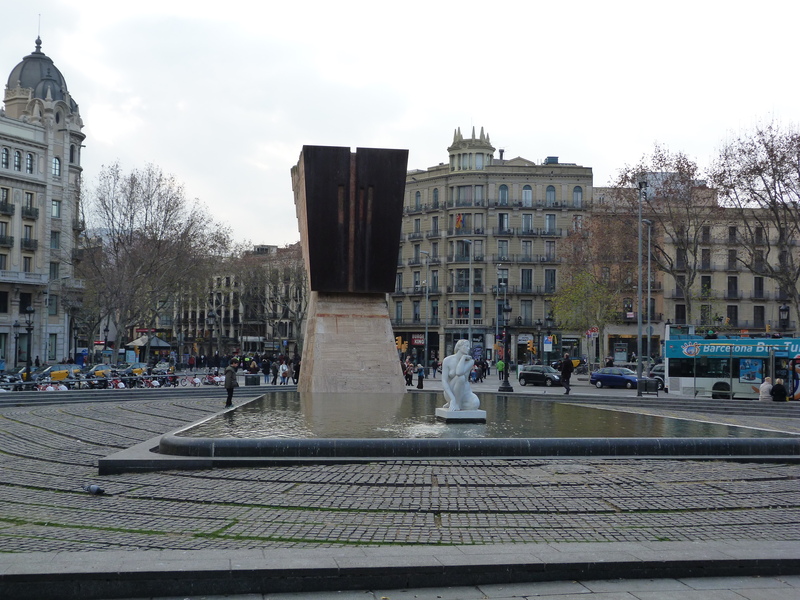 The apartment building was a showcase for L’Eixample and represented the pride in the growth of Barcelona. 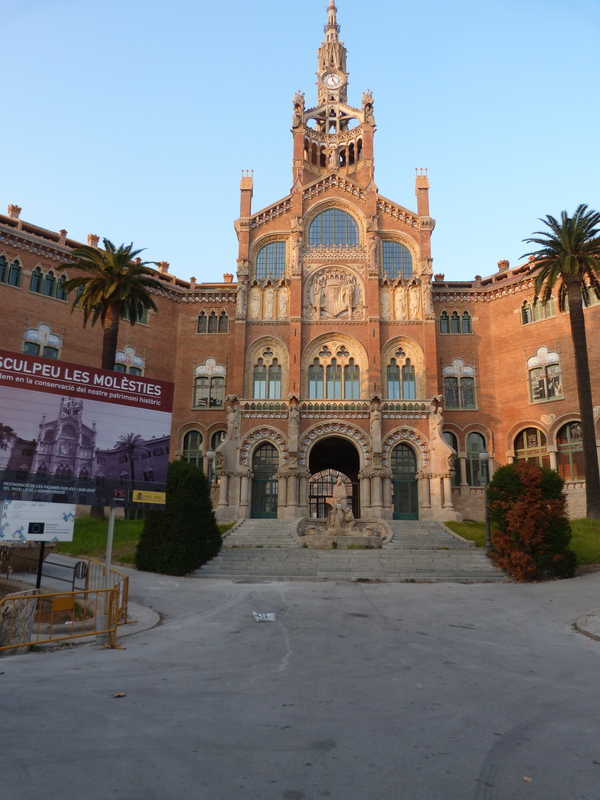 A UNESCO World Heritage Site, the building is now owned by CatalunyaCaixa, an organization that focuses on Cultural, Environmental and Educational social projects. 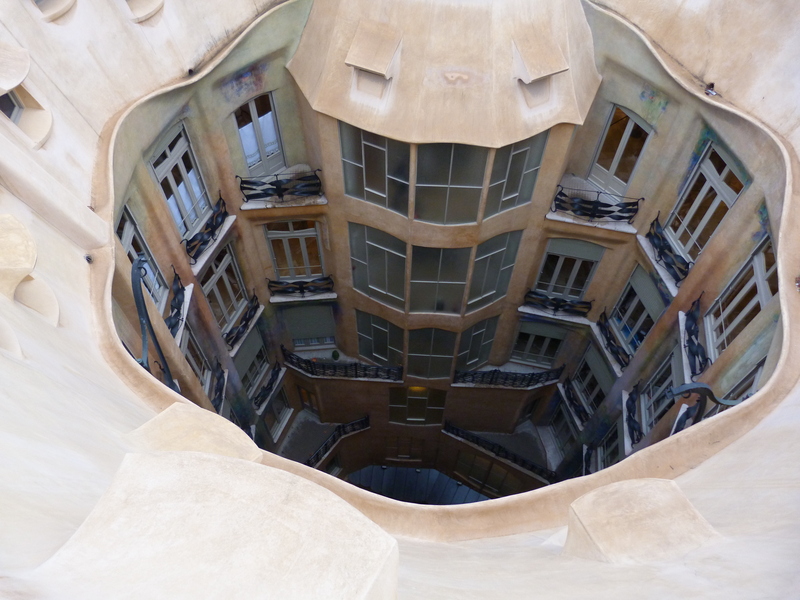 A portion of La Pedrera, including an apartment on the 4th floor, is open to the public. 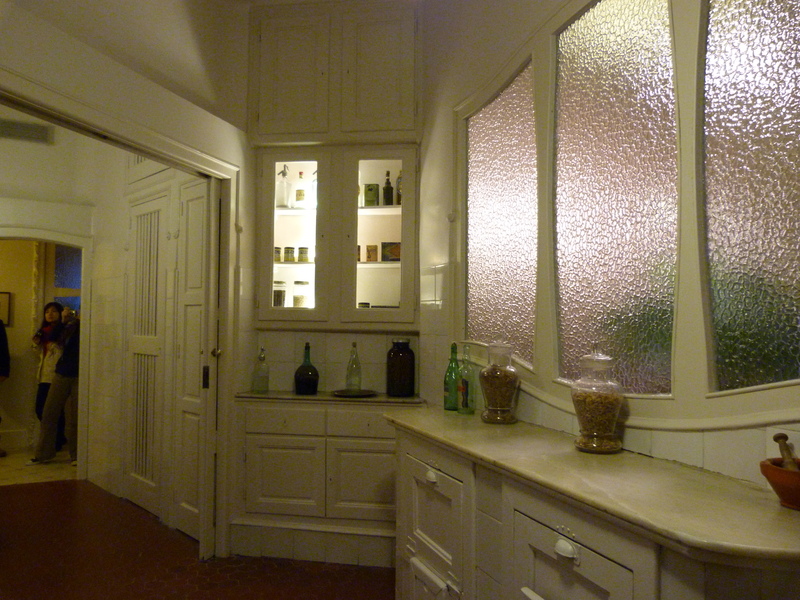 It recreates the home of a bourgeois Barcelonian family of the early 20thcentury, complete with all original fittings. There is a softness to the lines in the apartment, and ingenious “modern” design elements including a composting and heating system that make the apartment feel far more contemporary than it is. On one side the apartment building circles around an inner, private courtyard. On the other it faces outward to the busy city. The roof top terrace was the most exciting part of the building for me. 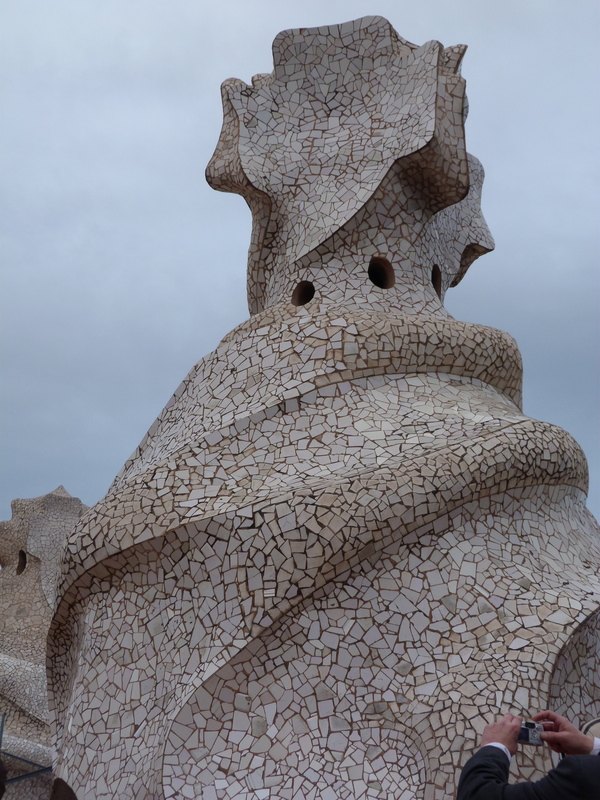 Gaudí created harmony in all of the elements of his buildings, always embracing beauty and natural forms. The curves on the front of the building are mirrored in the dipping and swooping of the rooftop. The architectural sculptures on the roof are fully functional and encompass stairwells, ventilation towers and chimneys. 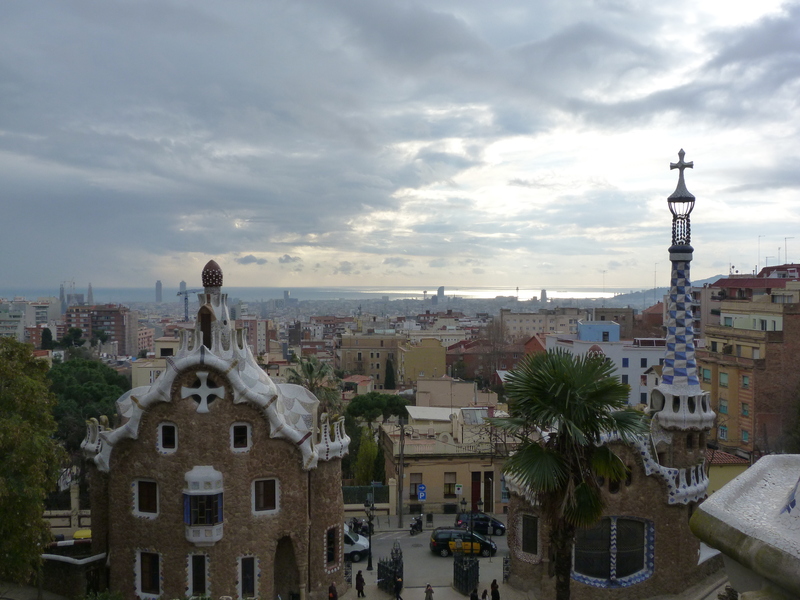 And the rooftop gives a fabulous view of the L’Eixample and Sagrada Familia beyond. 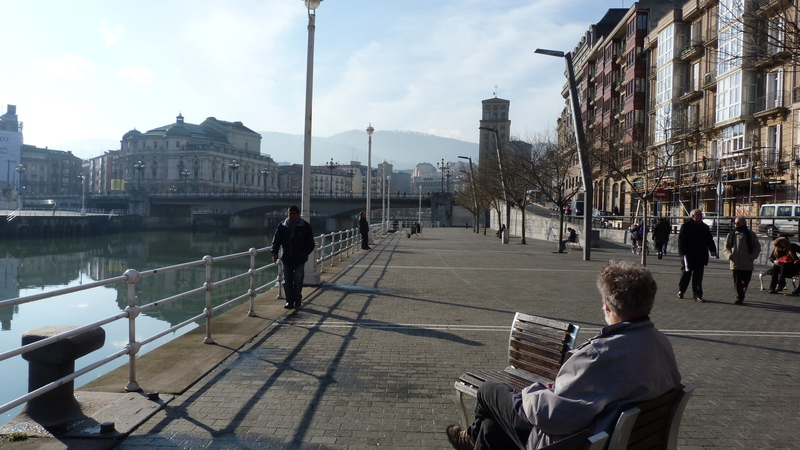 Going to Parc Guëll, we had a different view of the city. Funded by Count Eusibi Guëll, the park was originally envisioned as a housing site on a rocky hill with little vegetation called Muntanya Pelada (Bare Mountain). 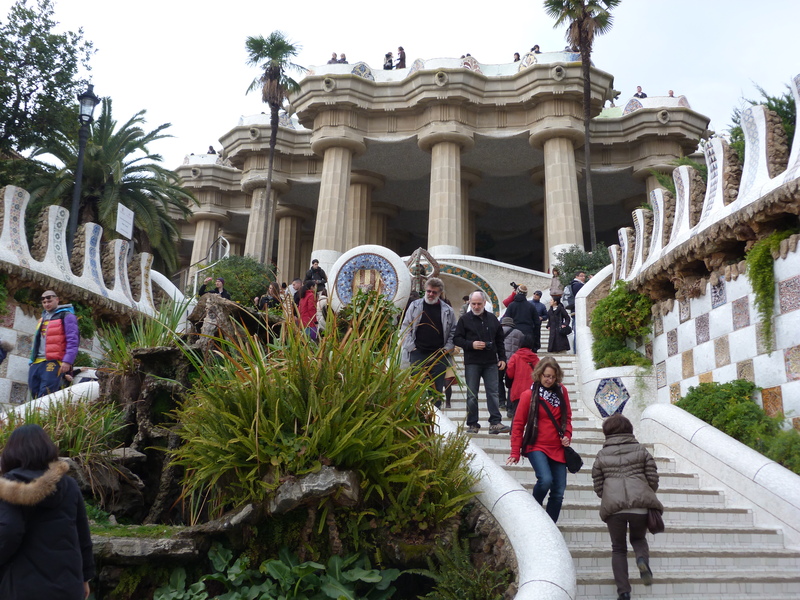 Sixty houses were planned, but in the end there were no buyers, so Gaudi designed the site as a fantastical public garden, filled with symbolic, historical and spiritual elements. The focal point of the main entrance is a huge mosaic dragon that curves around to become a large terrace surrounded by mosaicked benches. Apparently Gaudí used the impression of a workman’s buttocks in wet clay to give him the shape he wanted for the curvature of the bench. 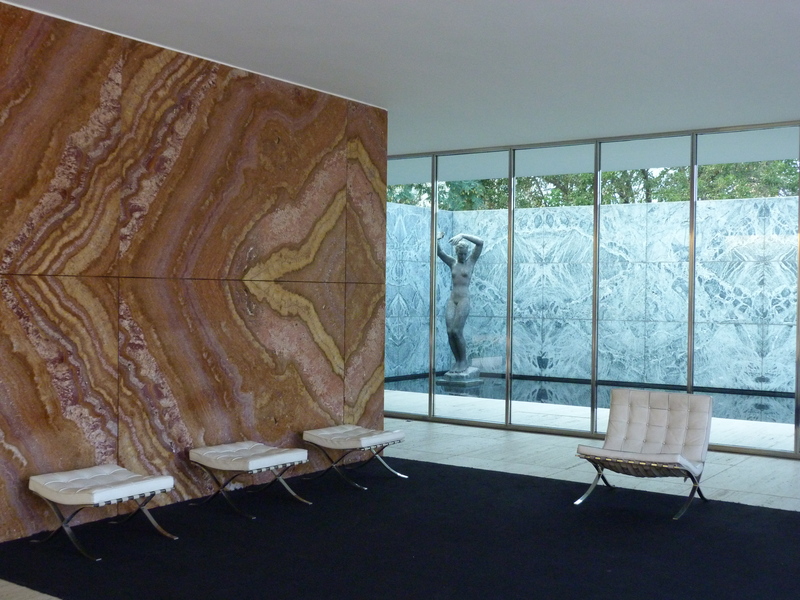 It is a wonderfully social space, and the curves invite weary buttocks to rest. 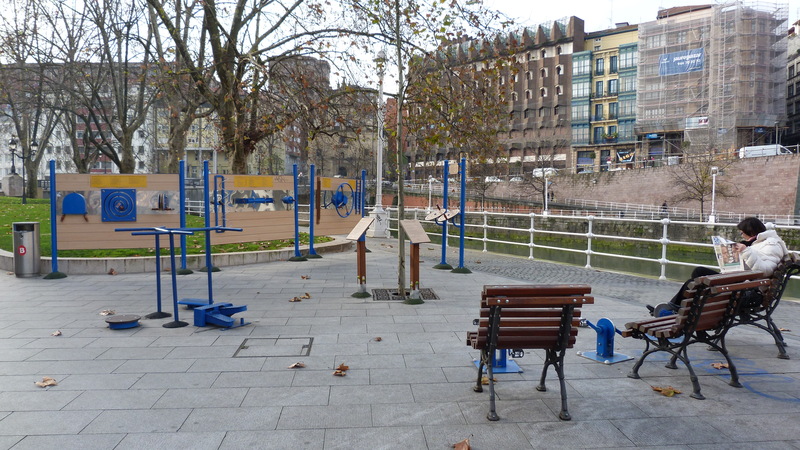 Small groups cluster on the benches. There is a feeling of intimacy and privacy. 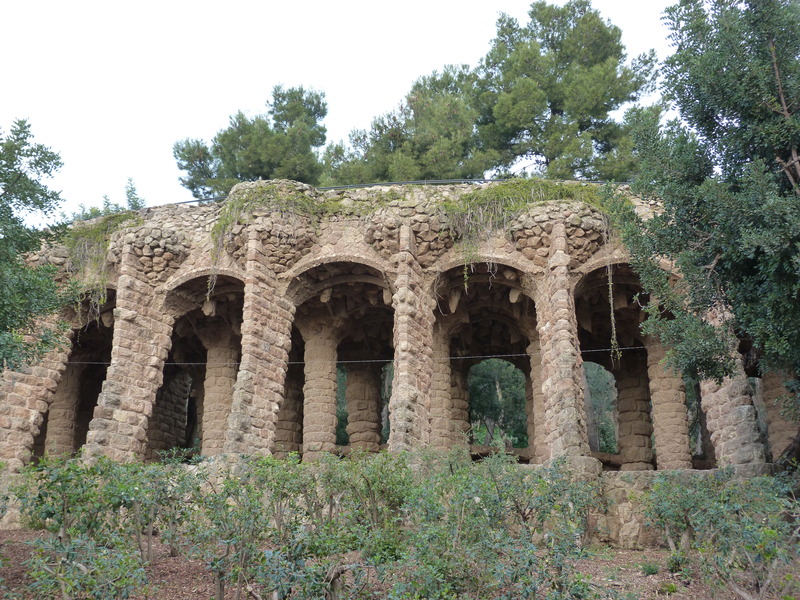 Weird and wonderful stone columns create walkways amidst thick vegetation. Mock Parakeets flit through the trees. 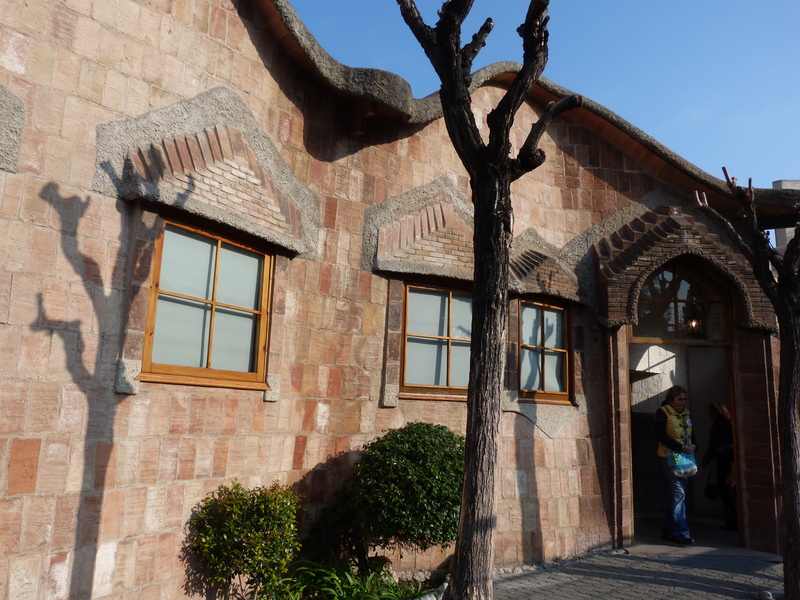 We walked away from the main tourist area, to the quiet of some stone archways. 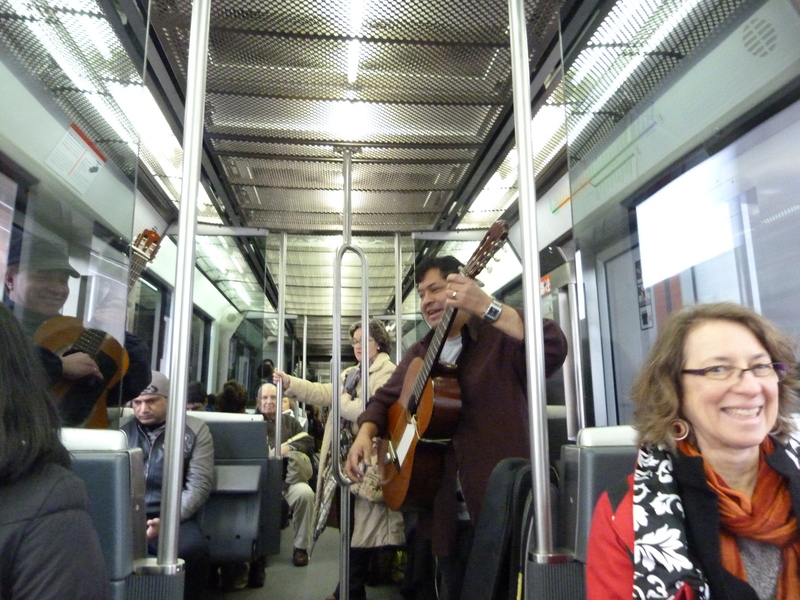 A lone classical guitar player was playing soft sounds that resonated off the stone and into our hearts. A human creating beautiful sounds on a simple instrument. As the park bathed us in organic shapes and texture, natural and manmade, the music completed the experience. 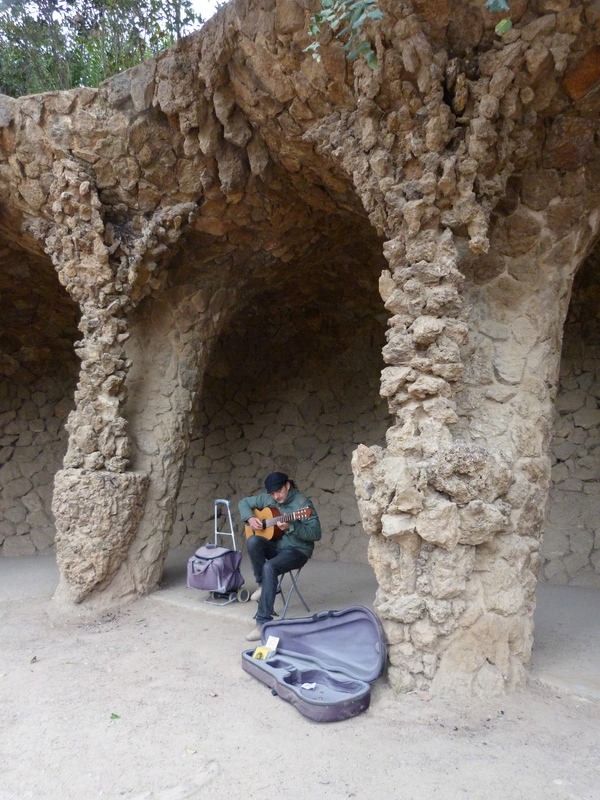 Gaudí and a simple street musician, brought us to a sense of home.